Think of this rollover jig like a rocking chair. If you tilt far enough you'll end up on your back. 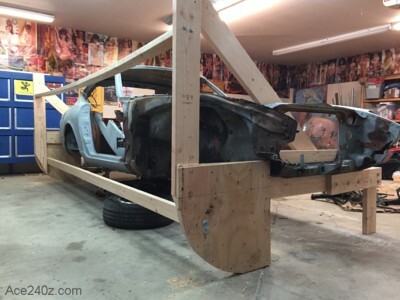 It's only 90 degrees, but if a skinny chair can hold hold you, why can't a few pieces of construction lumber do the same for your stripped-down car? 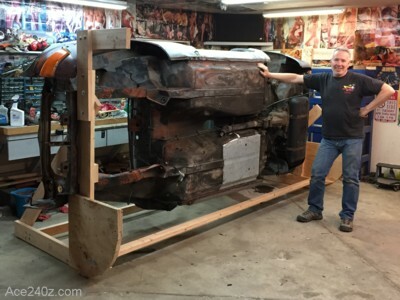 A stripped-down 240z chassis weighs about 600 pounds, which means you're only supporting 300 pounds on each end. Do you have a backyard deck? Peek underneath and you'll see it's made with the same size boards. They support you and some buddies and a grill, so why not a car? In 2017 I bought some Bad Dog frame rail reinforcements (great quality) for the the underside of the body. I could raise the car on jack stands and crawl underneath but it would be a dirty and exhausting job. A body shop rotisserie would be perfect, but they're expensive for a one-time use like mine. That's when I found a "redneck rotisserie," also known as a rollover jig, on YouTube. Take a look at some videos here and here and here. At first glance the idea seemed a little crazy, but having done a fair amount of framing construction the concept began to make sense. If others could do it, so could I.
I took some measurements and made a few drawings, then decided to build it. The cost was about $80, which is amazingly affordable. Some friends and coworkers thought I was nuts but obviously I didn't pay attention to their well-intended advice and dire warnings. Thankfully they were wrong. A couple of people have asked for a copy of my drawings. Sorry, but I can't risk the liability if someone used my design and it failed. However, I can show you how I built it and offer some details and hopefully that will be enough to get you started. Let me stress that building something like this is very dangerous. If something breaks you could be injured or killed. 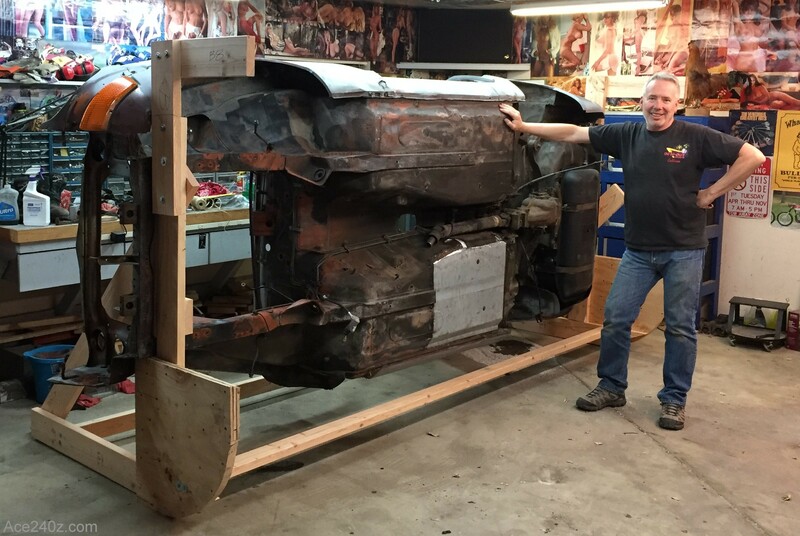 If you're not confident in your fabrication skills, find someone to help or find a different way to support your car. Click on the pics to see a full-size version. The jig is made from 2x6 lumber, plywood, some glue, and a lot of lag bolts to hold all together. I didn't want anything coming apart because it would lead to utter disaster and a terrible end to my project. The rockers need to be extra heavy duty because as the car is being tipped over they support the entire weight. I made them three layers thick, partly to keep them the same width as the lumber, but mostly for strength. Be very liberal with the glue and use a lot of screws to hold everything tightly. Let them dry overnight. I used 2x6 boards for the frame. 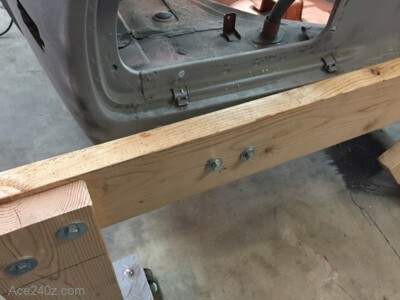 With the car on jack stands, I "sandwiched" the front frame rails between two boards because it's the strongest part of the front. Measure carefully for the tightest fit you can get side-to-side, but leave a slight gap between the upper and lower boards, then squeeze them tightly together for a strong grip. There are a couple of small holes beneath the radiator that you can use to stabilize it, but they're too small to use as a lifting point. 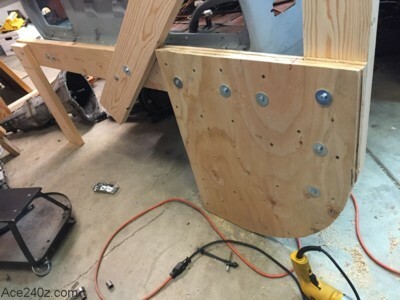 For the rear, I used the bumper mount holes with the longest bolts I could find, then added some scrap plywood as spacers to keep the board away from the body. Depending on how far you've taken the car apart you can use the bumper hangers, but mine were in a box somewhere. 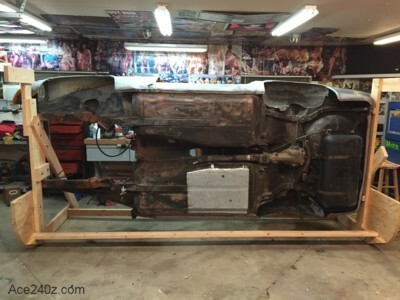 I attached the rockers to the wooden crosspieces and made sure they were located far enough outward so that when the car was tipped over the body wouldn't touch the ground. Next came the vertical pieces for the side, with crosspieces for extra strength. 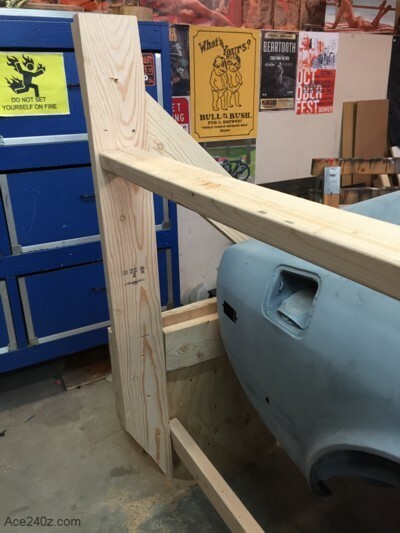 When you roll the car over, these boards support it so make them as strong as possible. Note how they attach to the rockers, with a lot of lag bolts to hold everything together. I added some 2x4 studs to tie the front and back together. I tend to over-engineer but wood is cheap compared to repairing sheet metal. Last were a couple of small pieces to hold the car up when I removed the jack stands. When you roll the car on its side, wrap a towel around the bottom of each piece because they stick out and you'll probably hit one with your head. With my wife filming, a friend and I slowly, carefully, cautiously tilted the car over. 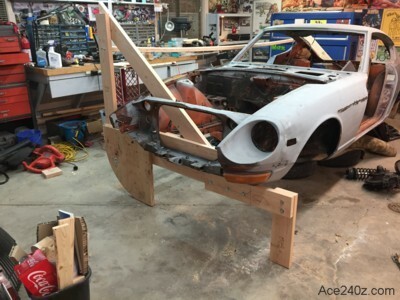 The jig is so sturdy that I can drag it around, then hammer and kick the car to my heart's content without worrying it's going to collapse. I wanted easy access and here it is! I decided to remove the differential and to my horror I discovered the mounting bolts were only finger tight, and one was broken off. 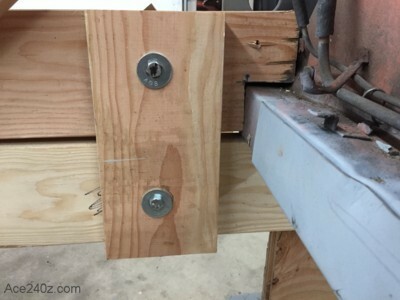 If I hadn't built the jig I would have never known about he bolts until disaster struck. Now I can finish welding the new floor, add the frame rail reinforcements, and patch a bunch of holes.